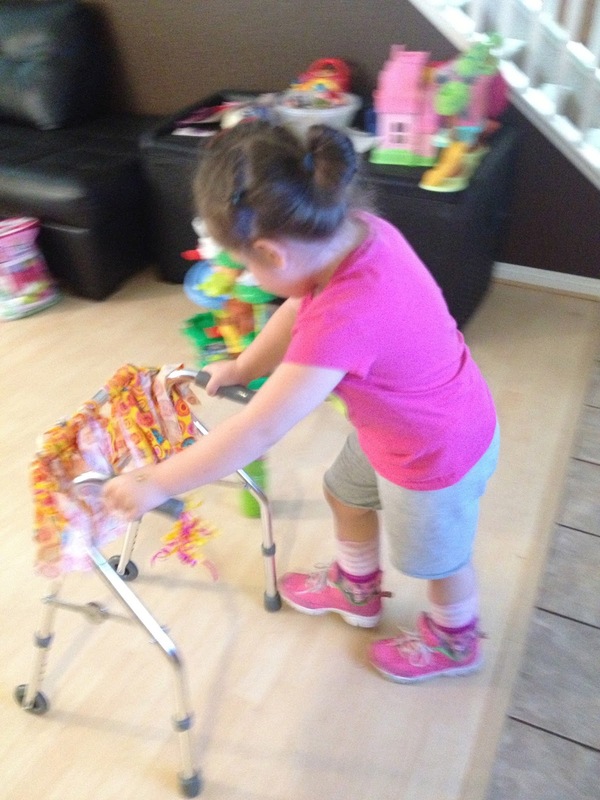 With Hailey wanting to use those legs of hers to her fullest ability, we've given her the walker we got from the hospital back in January 2012. (The second time she lost her ability to walk) She didn't exactly remember how to use it. The first thing she did after we told her to hold her walker to walk was, pick up the walker in both hands and walk while literally HOLDING her walker. Silly child! I think she's got the hang of it now. She also has a walker she uses at school, and she really gets around. 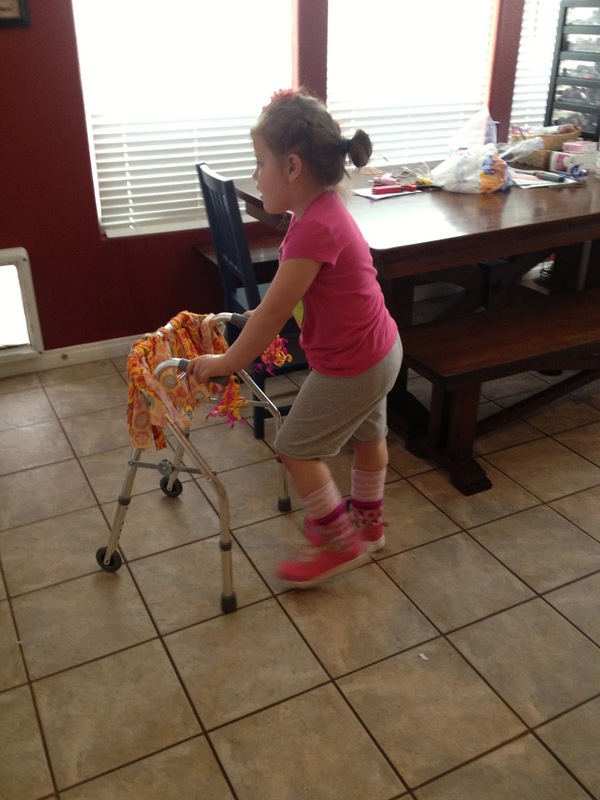 She isn't totally dependent on the walker, she still lets go and tries to walk on her own. When she is tired and still insists on walking we put the walker by her so she can use it. With this new "freedom" comes new anxiety for me. If I could wrap Hailey in bubble wrap so that when she fell down she wouldn't get hurt I would. I walk behind her with my arms in the "Ready to Catch You" position. Sometimes she doesn't want to hold my hand and she wants to do it herself. Which I'm glad for the sense of determination and will but, I can't let her go on her own just yet. I don't even remember what is what like when I didn't have to watch her like a hawk. I remember when she was a tiny baby and we didn't know of this scary Leukodystrophy word, and I would think to myself while looking at her perfect face, "How am I going to let you drive a car all by yourself one day?" "How am I going to let you go off to college and not see you every single day?" "How am I going to let you live your own life and possibly only see you on holidays or only a few times a year?" Now that those things might not happen I find myself thinking the opposite. I want her to be able to live her life and drive a car by herself, go to college, and be able for her to live her own life. I have to be able to let her do things on her own. If she wants a drink or snack I have to be able to say, "let's go get it." instead of "let me get it for you." If she says she wants a book I have to allow her to get to the walker and go pick a book from the bookshelf instead of me going and getting it for her. She wants to, and I kind of hold her back. Josh is the opposite. He gives her the independence she wants. She ALWAYS wants to help and even though it'll take him 10 times longer to accomplish a simple 2 minute task he lets her help. You can always hear, "I'll help you!" from Hailey. So even though I can't just sit there and watch Hailey if she's going to fall, I allow her to make those mistakes and missteps and stumble. I show her why what she planned didn't work. We tell her when she falls that she'll be alright and to try again. She's great at crawling and with there being less of the chance of getting hurt if she does it she'd rather walk. We've got to work on those muscles and coordination. I keep thinking if it was me and I was lacking coordination, depth perception, and had muscle weakness and spasms I'd stick to what works and crawl. That's not Hailey. She doesn't want the easy way. The hard way is Hailey's way. Learning to walk again after a year is no easy task for anyone but, if you have the will you can get farther then you think. Just look at Hailey. That's Our Girl! Stubborn, independent, confident, tenacious. All the qualities she needs to do the most and experience all available to her. Love you, Hailey. Love your super Mommy and Daddy, too. Grandma.